The following Terms and Conditions (the ‘Terms’) apply to and govern the Morleys Rewards Loyalty Programme promoted and operated by Morleys (“Morleys “, “we”, “us”, ‘our’). All Programme applicants must be individuals aged 16 years or over and once approved we will activate your Morleys Rewards card and you will become a member (‘Member’). All Members must register their card with a valid email address, when we will consider and may approve your application. Change of email address must be notified to us. We may refuse an application for any good reason. Members will be able to update their personal details in store by contacting a sales advisor. You can apply for an Morleys Rewards card free of charge at Morleys store or online at www.morleysbexleyheath.co.uk/morleysrewards. Your Card is issued by, and remains the property of, Morleys Bexleyheath, 19 The Mall, Broadway Shopping Centre, Bexleyheath, Kent DA67JJ. 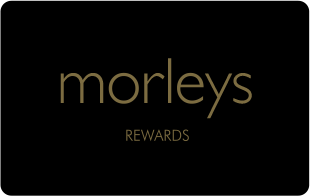 Morleys Rewards cards must be destroyed or returned to us on request when no longer valid for use. Members cannot add money to their card; it is a promotional loyalty card and not a cheque guarantee card, debit card or credit card. You cannot transfer your Card or any of the stored points on it to any other person. The Programme is only for personal, household and consumer use, points can only be earned, held, transferred or redeemed as set out in these Terms, or in the terms relating to any promotions and point offers related to the Programme, and may not be earned, held, transferred, redeemed, or otherwise traded in any other way. We reserve the right to suspend or to terminate any Member’s Programme account, if in our sole discretion we consider that the Member has breached the Terms or if the Member has supplied false or misleading information, or if we consider that the Member has acted improperly or in an abusive, defamatory, criminal, or offensive way to any other Member or to our staff. Members will accumulate points on their Morleys Rewards card when they make qualifying purchases. Points have a minimum lifetime of 12 months and a maximum lifetime of 18 months – depending on when they were earned. For example: Points collected April – September (6 months) will be valid until September 2019. Points collected October – March (6 months) will be valid until March 2020. Before the end of each period registered members will receive an email alerting them to any unused points and the deadline for redemption. Any points not redeemed before the expiry date will be erased from the account. Once Rewards have expired they may not be used to make Programme purchases. 7.5 The Morleys Rewards card cannot be used to earn or redeem points in some of the stores non-participating concessions. The following terms shall apply to the redemption of any rewards: Members can redeem rewards in store upon reaching the qualifying level; Reward points may be used as full or part payment. Only one Morleys Rewards card can be used per transaction when redeeming rewards; Purchases made with rewards may not be re-converted back into points. Any refund of items purchased using rewards will be made by crediting the applicable amount of points back onto the Morleys Rewards card; and, points may not be redeemed for cash under any circumstances. The number of points earned from a purchase or required to qualify for a particular purchase may vary from time to time at our sole discretion. Points will not be awarded when purchasing gift cards/vouchers. Rewards cannot be used to purchase gift cards/vouchers. We may terminate any Member’s Programme account should the account be inactive for a period of twenty-four months or more, determined by the last date any points were accumulated or redeemed. Any points that were accredited to a Member’s Programme account will be lost if the Member’s Programme account is terminated or the Programme is closed. If an account is closed by a Member or us then the right to redeem points from that account is lost. A Member can terminate his or her Programme account at any time in store or by notifying us by email. Members will receive regular email updates of their points balance. We will correct an account if it is shown to our reasonable satisfaction to be wrong but, unless there are clear records showing this, our decision is final. Points are personal to an account and cannot be transferred or combined with another account to redeem a reward. Members may also receive additional rewards (“Benefits”). Benefits will be provided subject to availability. Benefits may be subject to additional terms and conditions, and, when applicable such terms and conditions will be made available to Members from time to time in correspondence, and/or in store. Morleys may amend the additional Benefits it offers Members at any time. Morleys is not responsible for the loss of a Member’s Morleys Rewards card, which must be kept securely by the Member. Members that lose their card will lose all of the points that had accumulated on their card unless they contact Morleys promptly to notify them of their loss. Points may be transferred to a new card at Morleys sole discretion. We regret we cannot be responsible for any unauthorised use of points. Any points not earned and held in accordance with these Terms will be invalid. Any such points will be deducted and other appropriate action may be taken by us. If Members lose their Morleys Rewards card or think that an unauthorised person has discovered their security code, password or account number, they should refer to the information on lost and stolen cards online and for advice on obtaining and registering a new card. These Terms may change and Members will be deemed to have accepted the updated Terms when they go online, or when they use their Morleys Rewards card. As such we strongly encourage you to review these Terms from time to time. We may suspend or terminate the Programme at any time at our sole discretion and for any reason. In such event Members will be notified and all accounts will be suspended or terminated. If Morleys has a change of control or is sold or if we decide to sell or transfer the Programme to another company we may transfer all of our rights and obligations under these Terms to such other company or acquirer without any further consent and you now consent that we may disclose or transfer all information we hold about all Members including you to any prospective or actual new owner. Such a disclosure or transfer will not alter the rights of Members in respect of the use that can be made of such information by such other company or acquirer until the Terms are changed by such company or acquirer in accordance with Section 19 above. The limit of our liability under these Terms will be exclusively to a Member who suffers a direct loss as a result of our breach of these Terms and in those circumstances our sole liability will be to credit to the relevant Members Programme account such points as may have been wrongly deducted or should have been credited but were not. Nothing in these Terms shall operate to limit any liability we may have for death, personal injury or fraud and these Terms shall prevail in the event of any conflict or inconsistency with any other communications, including advertising or promotional materials. These Terms and any dispute, claim or non-contractual obligations arising out of or in connection with them or their subject matter shall be governed by and construed in accordance with the law of England and Wales and you irrevocably agree that the courts of England and Wales shall have exclusive jurisdiction to settle any dispute or claim that arises out of or in connection with these Terms or their subject matter.